Refraction index 1.54 - similar to Canada balsam or the ordinary ray of quartz. No apparent polymerization with age. Insoluble in mineral oils; in soluble oils in any degree of concentration; or in water, plain or modified by any of the normal wetting agents. 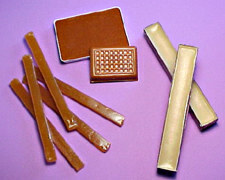 Fully Thermoplastic -- Melts quickly above 80°C (176°F), and flows freely at 180°C (356°F) to form a uniform thin film. Chills very quickly to the solid state at room temperatures to form a strong, tenacious bond without appreciable expansion. Has no toxic effect, and gives off no dangerous or disagreeable fumes or obnoxious odors in either cold or molten state. Over a period of 10 years no instances of allergy due to its use have come to our attention. Can be sawed, drilled, ground, or sanded wet without sticking or picking up abrasive. Dry machining can be employed if due care is taken to prevent joint heats above 80°C. Affords a firm bind with vitreous or polished metal surfaces capable of withstanding the frictional drag of mechanical polishing.